It is our hope that you folks have a super 2007. 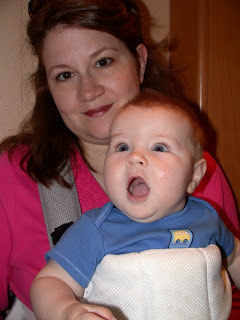 We had many exciting adventures this past year with family and friends. 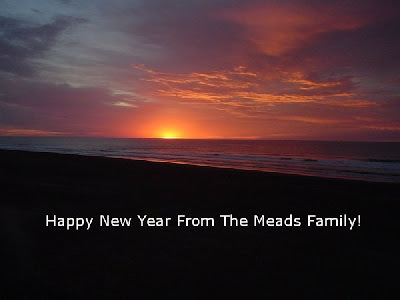 May you folks have many positive adventures in your lives during the upcoming year! Dave Brown directed my attention to a June, 1969, edition of the Glenville Democrat. The titile of a photo was "Will Be Unique Entry In Festival Parade." If anyone knows if this critter is still in existence, we would appreciate a call. Here is the text that was placed under the photos. Forest Turner of 419 Charles Street, Glenville, should merit a big round of applause when his entry into the WV State Folk Festival parade moves down Main Street. The unique entry was made by Mr. Turner, who has given attention to every detail, large, and small. 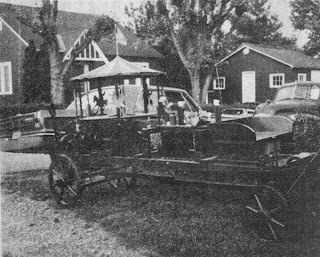 The unit consists of an 8-foot long wagon, on which are mounted a small merry-go-round, replete with tent top and miniature ponies and riders, two miniature figures sawing a large log, and a women churning the old fashioned way. And all the figures move,as does the merry-go-round. Small motors provide the power. What You did Not Know About Me! As you recall, Lee Kraus challenged me to explain five things that you folks would not know about me. OK Lee, this is the last entry in response to your challenge and is the most surprising and intimate! So my last “What You Did Not Know About Me” is that I have the biggest toe in all the world! I plan on placing the toe in the Guinness Book of World Records as soon as the holiday season is over. Hope you all have enjoyed my response to Lee Kraus’s challenge. How have I done. Lee? Please do not stare at the toe (which could use a much needed pedicure) over 30 seconds. The Surgeon General has determined that if you stare at it too long it may cause severe skin rash, hallucinations, and fear of sandals! I am with Sherrell Wigal in the above photo. Sherrell is a classmate of mine from the high school years. 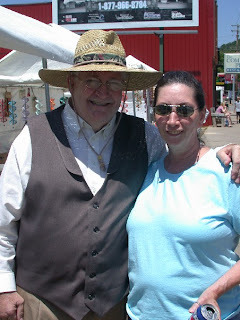 She is a wonderful West Virginia poet who appears regularly at the West Virginia Folk Festival. Todays number four little known fact is that most folks do not realize that I am web master for the West Virginia Folk Festival website. 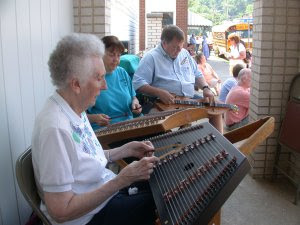 Judy and I have enjoyed working with the volunteers that are the life blood of the Folk Festival. The festival is blessed with a volunteer community of loyal and dedicated folks. They are hard workers and we have been warmly welcomed into their family. This website is a new critter on the internet. The old website was maintained out of state by a Festival friend. In order to keep current the committee activities and events, we have developed this new site. We would appreciate any suggestions or comments that you may have on our new website. This is entry three of things that you may not know about me. While I retired from teaching in 2002, this past year I had a per diem job with McDougal Littell Publishing Company. Last year was the adoption year for science texts in West Virginia. I served the company as science consultant from August of 2005 and will complete my responsibilities in December of 2006. Our company developed a new Middle School Science series. This is a great science program for 6th, 7th, and 8th grade science. We also sold three chemistry texts and one earth science text. The teachers in West Virginia were very receptive to our science programs and we are appreciative of the texts they ordered. It was super to be able to travel throughout West Virginia and visit my many friends that are teaching science in the public schools. Our state is blessed to have science teachers that are competent and enthusiastic about the teaching of science. I have to thank two folks that made my year at McDougal Littell wonderful. These ladies are Lisa Williams and Louise Law. Lisa Williams, Regional Manager for Ohio, West Virginia, and Michigan, is a marvelous person. She made me feel immediately that I was an important part of the company. She is an amazing woman who is so talented, hard working, and caring. Louise, the other per diem for West Virginia, trained me in the procedures of text book presentation and made the experience so fun! These two ladies are such an asset to McDougal Littell. Thank you ladies for a great year! I thought you all would appreciate viewing some of the fliers that Doc distributed. At Judy's request, Doc did a magic show at Gilmer County High School where she taught. The climax of the show was jerking Principal Bill Percy's shirt from under his blazer and finally sawing Bill in half as he lay on a table. Doc did also a show for Glenville State College. I am fascinated with magic. Two of our friends who grew up in this community, Eric Chico and Daniel Reed, also are interested in sleight of hand, prestidigitation, and legerdemain. They both are very proficient in the magical skills. 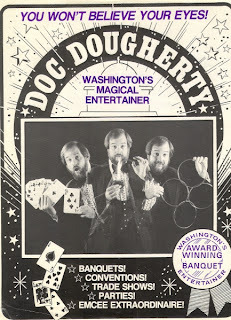 I can not think of magic and magicians without remembering Doc Daugherty. Doc was a friend of ours since the college days. Doc’s father was a professional magician and ventriloquist. 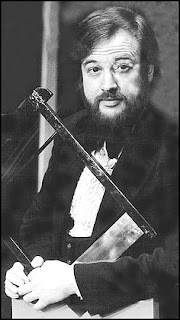 He performed during the early Vaudeville years. Doc was an only child and we were among his small circle of friends. 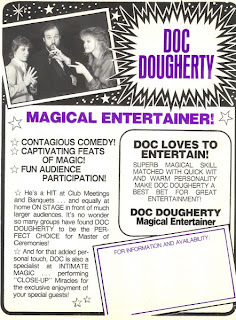 Doc was a fantastic magician! Every time he would visit, he would do a show for our family. 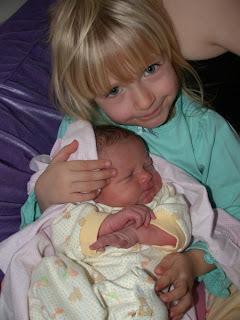 The girls always knew that when he arrived it was time to be amazed. Doc worked as a photographer for the Smithsonian Institution in Washington, DC. He led a solitary life. On one visit he brought his new “friend”. He had never had a pet and we were surprised when he arrived with a six foot cage containing his adopted friend, a cockatiel. As you can expect, this avian critter stole his heart. Well, birds can not be potty trained! Doc solved this problem by wearing his “poop” shirt when the bird was out of the cage and walked on his shoulder. Being a bachelor, his potty shirt was not periodically washed. He looked like a walking compost pile when he donned his “poop” shirt. I loved it when one evening Judy called us to supper. Here came Doc, the bird, and the infamous defecation shirt. Judy’s face was priceless! We were having turkey and dressing. Well, the bird must have looked at his cooked cousin and he started squawking loudly. The bird flew from its poop shirt and circled the table three or four times before being retrieved by Doc. As it was hovering over the food, I could see Judy thinking that this bird was adding extra seasoning to the gourmet meal! Doc worked part time at Al’s Magic Shop in Washington, DC. 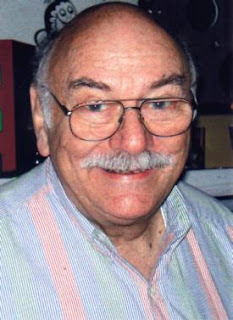 The store’s owner, Al Cohen (in the photo below), and Doc were very close as being fellow members of magical societies. Sadly, the world famous Al's Magic Shop closed in April, 2004. We had not heard from Doc for several years and so we tried to contact him through Al’s Magic Shop where he often worked. We learned that Doc had died from complications of diabetes. 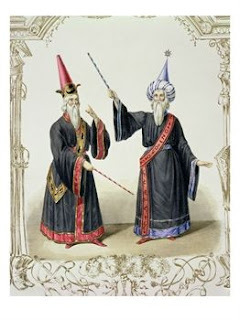 When a magician dies (a real, entertainment magician, not one who practices white or black magic, which I don’t believe in anyway), there is a traditional broken-wand ceremony, in which members of the Society of American Magicians break the dead person’s wand, symbolizing that it has lost its magic. 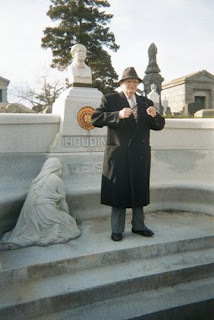 The broken-wand ceremony was first held in 1926 after Houdini’s death. Doc’s wand was broken in a ceremony after his passing. OK, Lee, I have accepted your challenge! My first little known fact was that, while attending Spencer High School in the 60’s, I worked as a disc jockey at radio station WSPZ. On weekdays I hosted “The Jim Meads Show” (quite a unique name! – chuckle). The show was from 5 to 6 PM and I played the current hits on Billboard’s top 40 chart. WSPZ 1400-AM signed on the air on Sept. 12, 1961, with 1000 watts day and 250 watts at night. I remember clearly of having to go into the transmitter room and flipping the switch to reduce our coverage power. It was always warm in the transmitter room since large vacuum tubes were instrumental in providing power for our limited signal. Fans continually cooled the circuits. The frequency became available because WCAW in Charleston had moved from 1400 to 680 kHz. 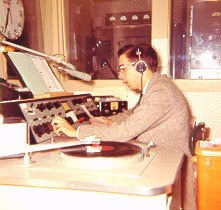 The photo above is of Bill Newbrough sitting at the broadcast console and showing the old Collins board and turntables. Another deejay, Charlie Ray, taught me the operational procedures for the Collins board. We would cue up the 45 or 78 rpm records on the turntables to the left and right and all of the recorded commercials were on large magnetic tape cassettes. With the advent of technology such as mp3 files, CDs, DVDs, I am certain that the broadcast board would be an antique. Speaking of the rapid changes in technology, I was amused when I did a presentation for an academic banquet for Glenville Elementary. I asked the students if they knew about 45 or 78 rpm records. Not one hand went into the air. I then said, “Who knows about CDs, DVDs, and I pods?” Everyone knew of those items. How things have changed! The fellow who hired me at WSPZ was a fellow whose name is now famous in the country music arena. It was Tom T. Hall. Tom was working as a deejay at the station and left for the big city of Nashville soon after he hired me. That was the year 1964 and, within months of his arrival in Nashville, Hall's songs were on the charts. His material has been recorded by the likes of Johnny Cash, Loretta Lynn, Faron Young, George Jones, Waylon Jennings and dozens of others. Perhaps the most celebrated of these was "Harper Valley PTA" recorded by Jeannie C. Riley which sold over six million records, won a Grammy and a CMA award, crossed over to the pop charts, and inspired a movie and TV series. 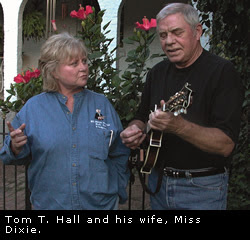 Tom was single while in Spencer and only married his wife "Miss Dixie" after arriving in Nashville. I, on the other hand, left Spencer in the fall of 1964 to travel to Glenville, WV, in order to begin my academic career at Glenville State College. In 1966, the station was acquired by Nubro Broadcasting Co. The call letters WVRC were chosen to stand for "the Voice of Roane County." 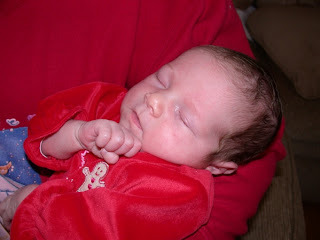 Yes, it is time to count our many blessings. How thankful we are for our friends and family. 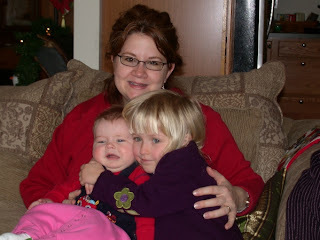 This has been a special year since this year two new grandkids made their introduction into our lives. 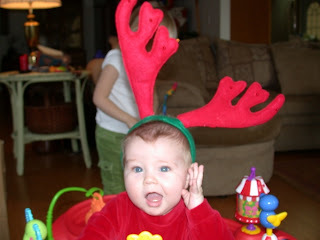 As you can see in the above photo, Sam is ready for Christmas! Last Sunday we had our family Christmas dinner and gift exchange. 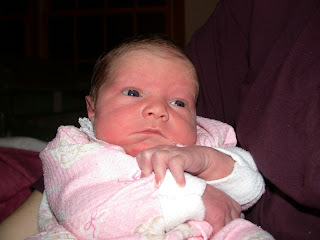 Here are some of the latest grandkids photo opportunities taken in the last few weeks. 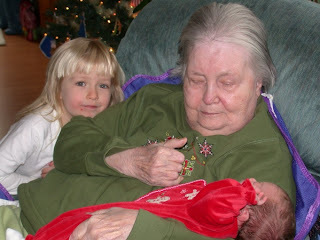 Flora is loving on Sam, but notice that Sam is not really into her cuddling at this time. 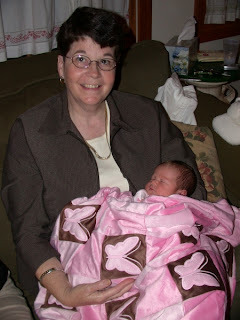 Aunt Judy is enjoying quality time with Lucy Mae. 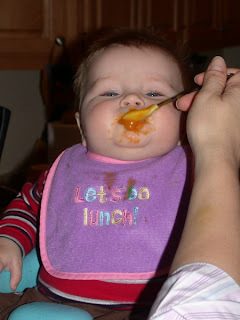 Sam has started eating solid food. 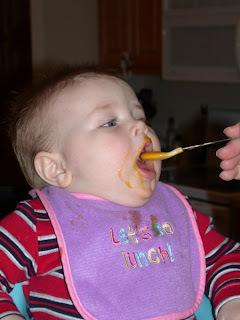 He started eating cereal and now as you can see he is experiencing yellow veggies! Yummy! 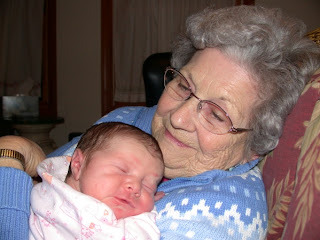 Do you think Grandma and Grandpa like their newest grand daughter? 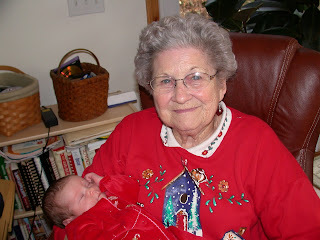 It is super to share the holidays with the great grandmas. 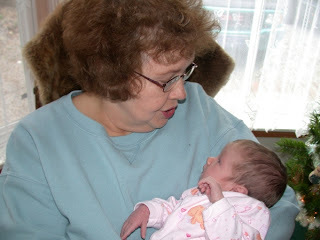 Here is Grandma Great Meads with Lucy. 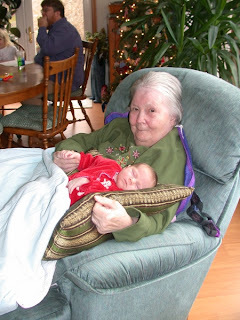 Grandma Great In The Big Chair is introduced for the first time to Lucy Mae. It is our wish that you all have a great holiday season and a blessed new year! 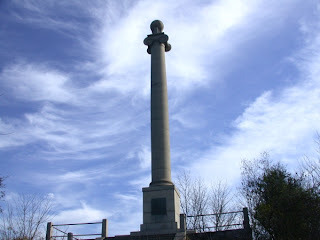 On our last visit to Rachael and John’s house, I walked around the corner to the Rumsey Monument at the end of Mill Street in Shepherdstown. 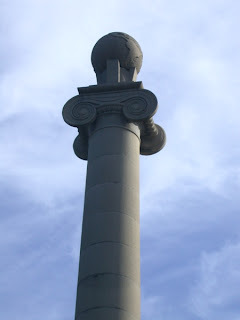 This imposing granite column was erected in 1915 as a memorial to inventor James Rumsey. Mr. Rumsey was fortunate to attract the attention and support of many of the important leaders of the time, including George Washington, Thomas Jefferson, and Benjamin Franklin, who set up the Rumsean Society in Philadelphia to support him. In 1785, Rumsey moved his workshop to Shepherdstown and built a boat with an engine that was powered by steam. 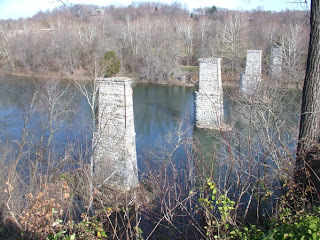 On December 3, 1787, Rumsey successfully demonstrated the boat against the current of the Potomac at Shepherdstown, 20 years before Robert Fulton's effort. 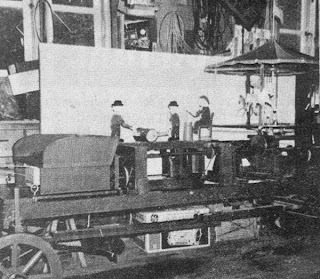 In search of financing, Rumsey traveled to Philadelphia and England, where he built a 100-foot prototype of the steamboat. 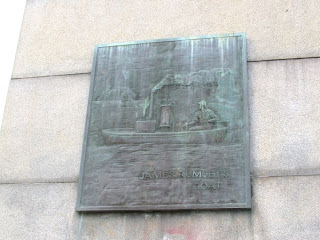 Unfortunately, he died suddenly after appearing before a London business group, and his competitor Robert Fulton-who demonstrated his boat on the Hudson River and got far more publicity-received credit for the first steamboat. Sarah and I were driving through the Rumsey Monument park when we noticed several large birds perched on a tree on the cliff overlooking the Potomic. There were a flock of black vultures. 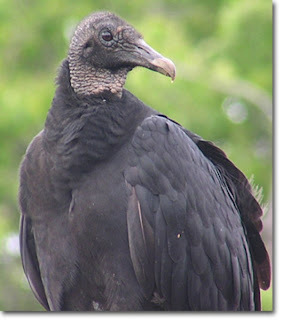 We see Turkey Vultures often, but the Black Vulture is a more southern species. It is more social than the Turkey Vulture, often traveling in large flocks. Black Vultures are scavengers that feed on carrion, but they also take weak, sick, or unprotected young birds and mammals. They soar in a group, alternately flapping and gliding, until one of them discovers carrion, whereupon all the others converge on the find. They are smaller but more aggressive than Turkey Vultures and will drive the latter from a carcass. Both species are often found perched in trees, on fence posts, and on the ground, or flying high overhead, especially on windy days, taking advantage of thermals or updrafts. Unlike Turkey Vultures, Black Vultures depend on their vision to find food. Coming home from Clarksburg on Friday, December 8, 2006, we pulled into the Rest Area before you get to Burnsville on I 79 South. Here was an eighteen wheeler parked with this submarine positioned on its open trailer. I asked the driver, who was on the way to his home in Huntington, the story behind this odd device. Well, James Bond fans, here is the story. This submarine, The Neptune, is actually a movie prop owned by The Ian Flemming Foundation and was important in the film, For Your Eyes Only. It travels the world and was most recently displayed in Baltimore. 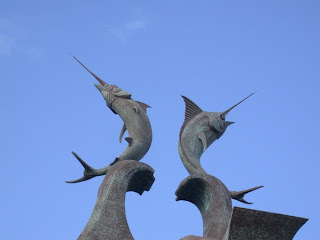 It is exhibited, along with other James Bond memorabilia, at aquariums other special exhibits. This submarine is the 22-foot long red and white mini-submarine used in the underwater battle between Bond and Kristato's henchman. Several Neptunes existed in one form or another, but this one was the one outfitted with engines and navigational equipment. Peter Lamont, Production Designer for For Your Eyes Only, designed and built this submarine in London. 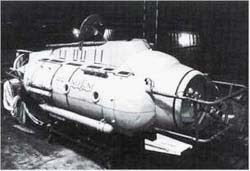 Perry Oceanographics of Florida outfitted the submarine with the engines. 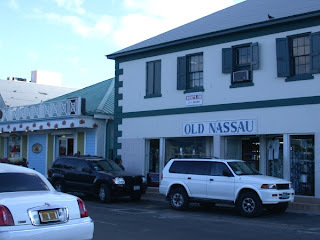 The underwater sequences using the Neptune were filmed near Nassau, Bahamas. The Neptune was donated to the Foundation by the Maritime Center on Long Island and the Intrepid Museum Foundation. Restoration of the Neptune was done through direct donations to the Foundation. It is interesting what stories one bumps into in this life - even in an interstate rest facility! 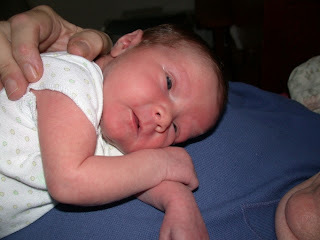 Flora is introducing us to her new sister, Lucy Mae Meeker, who was born on November 24, 2006. 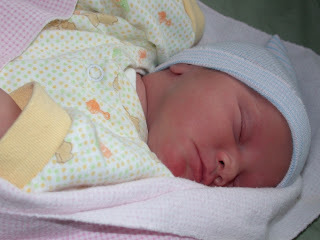 She weighed eight pounds and was eighteen inches in length. Rach and John know how to plan the holiday babies. Flora was born on Halloween and now they have Thanksgiving covered! 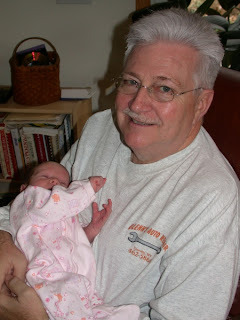 Seems as if Lucy likes Grandpa's chest. 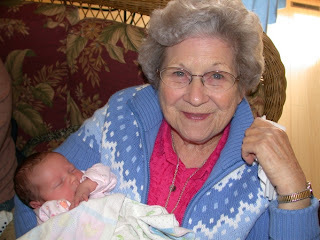 Here is Grandma Great Meads enjoying Lucy's company. 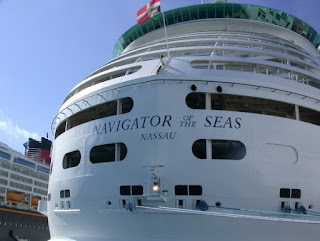 The Navigator of the Seas arrived back in Miami around 7AM. We had our last fine breakfast in the dinning room. 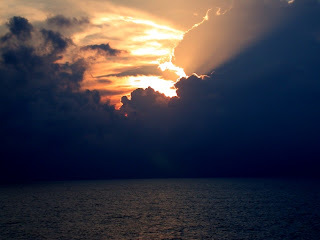 We had packed our luggage Friday night and placed it outside the stateroom by midnight as directed. Everything went so smoothly. We departed the ship around 9 AM. 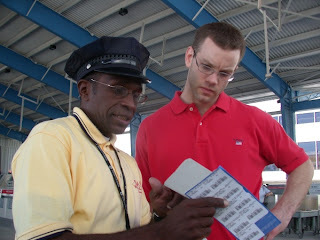 Royal Carribean had all the plans in place to make our departure and travel to the Miami airport efficient and trouble free. 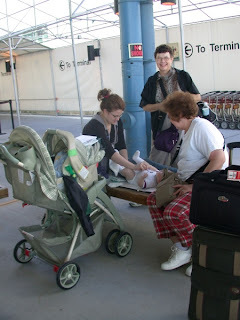 We were at the airport by 10:30. As you see, Sam needed some quality change time. 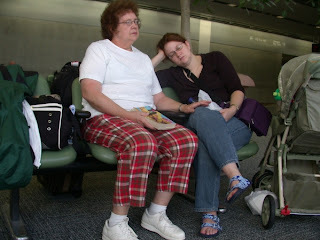 Here are the worldly travelers resting while they await our plane's arrival. I am certain they had visions of our many wonderful adventures swirling in their heads. Our flight was originally scheduled for 12:30 PM (the airplane was about 45 minutes late) and we arrived in Pittsburg after 3:30 PM. After boarding the hotel van, we retrieved our cars from our Pittsburg hotel. We arrived safely in Glenville that night. What a great experience! Thanks to our kids for providing us with this special trip. 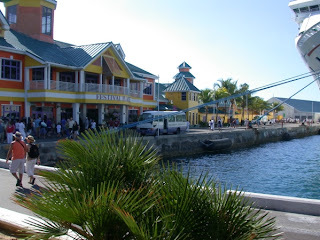 Nassau/Paradise Island is the home of the Bahamian national capital and our last port of call before heading back to Miami. 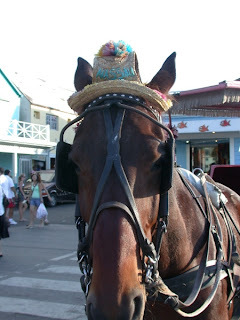 We arrived in Nassau at 1 PM and departure time was 7 PM. 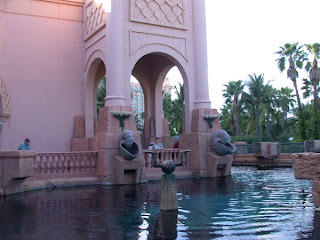 We decided to take a taxi and check out the Atlantis Resort and Casino. 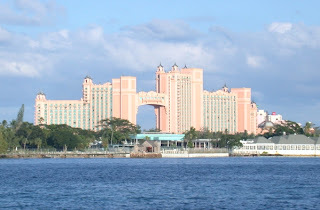 As you cross over the bridge that leads from Nassau onto Paradise Island, you will be in awe of the size of the Atlantis Resort. It is absolutely enormous! 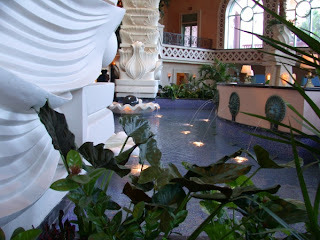 Atlantis was built by South African hotel and gambling magnate Sol Kerzner. 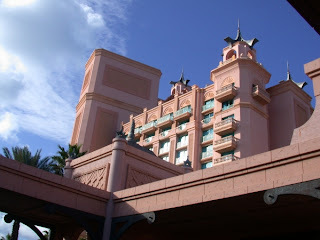 Atlantis is amazing with its plethora of entertainment possibilities. The Dig at Atlantis is part of Waterscape -- 34-acres (and growing). With numerous lagoons, home to many sharks, over 200 species of sealife, waterfalls, and brilliant water slides, it's hard to argue with claims that this is the world's largest open-air aquarium. We did not do the official tour of The Dig. We sampled the area by observing part of the attraction which is open to the public without charge. 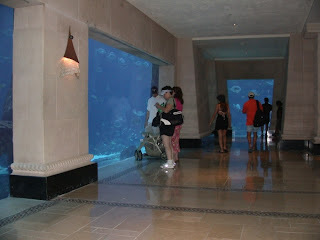 The Dig is a series of aquariums located beneath the lobby of the Royal Towers. 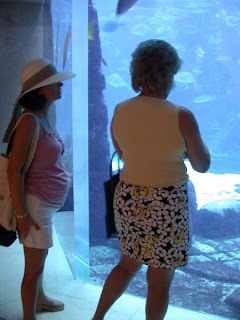 Hundreds of different aquatic species can be spotted in the Dig's various tanks such as angelfish, sharks, manta rays, and various types of jellyfish. The goal of The Dig is to provide guests with a taste of life in the legendary destroyed city of Atlantis. Interestingly, if one observes the bottom of the floors in the different aquariums, wreckage and debris will be scattered about representing the "Lost City of Atlantis." 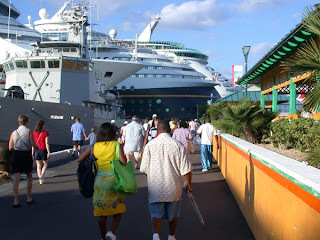 After looking around the Atlantis Resort, our crew headed back to the Pier area. 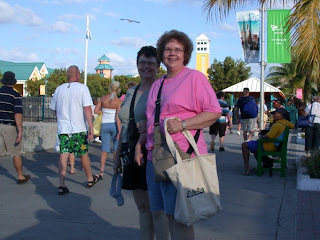 The grandmas decided to do some shopping along the waterfront area. Sarah, Sam, and I headed back toward the ship for a rest. Jeff decided to join the ladies in their shopping adventure. Here we are back at out home base. Sam looked up and was quite surprised. 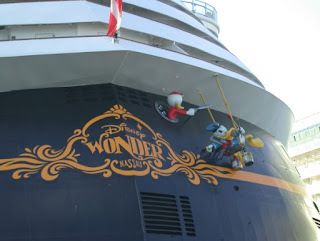 Wonder why he was so interested in the ship docked next to us? After supper, we ventured back into the Metropolis Theater for the Farewell Variety Show. We were amazed all week by a couple of performers who call themselves Fulcrum. The man and women were amazing to watch. How they could choreograph their wonderful movements was hard to understand? 3. Is this island surrounded by water? 10. What time is the midnight buffet?